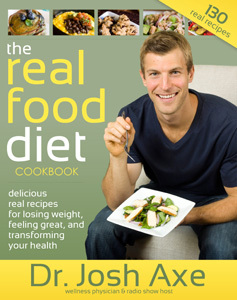 I was contacted about reviewing a cookbook called “The Real Food Diet Cookbook” by Dr. Josh Axe. I said yes immediately because it is something I can get behind: Real Food. You can read his bio here. 1. 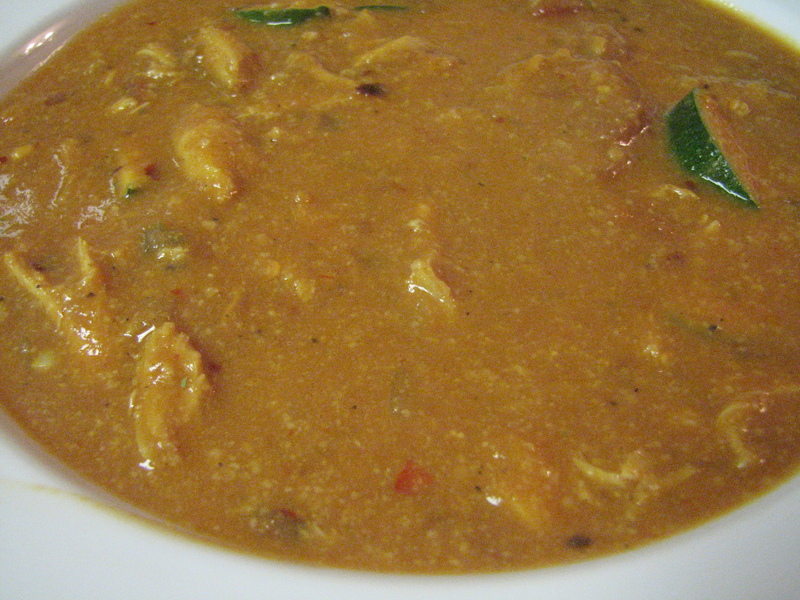 Heat sesame oil in large stock pot over medium heat. 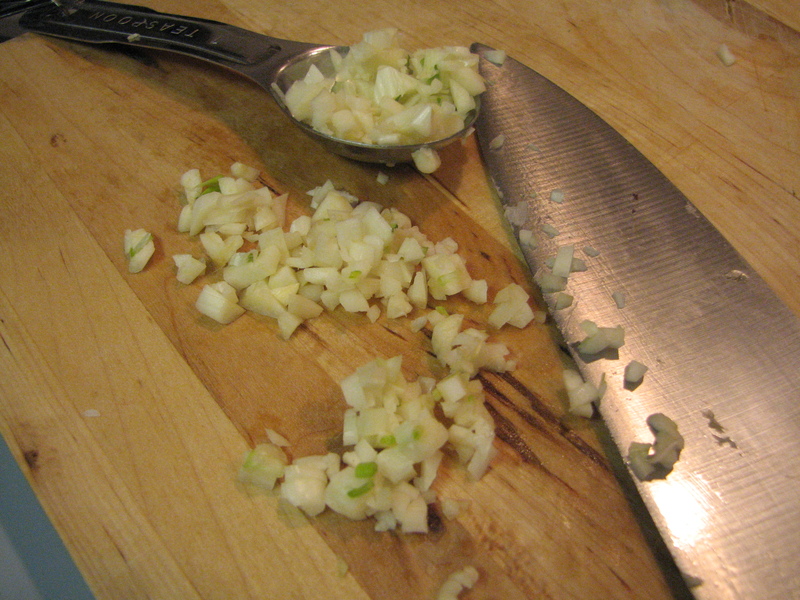 Saute onion until translucent. 2. 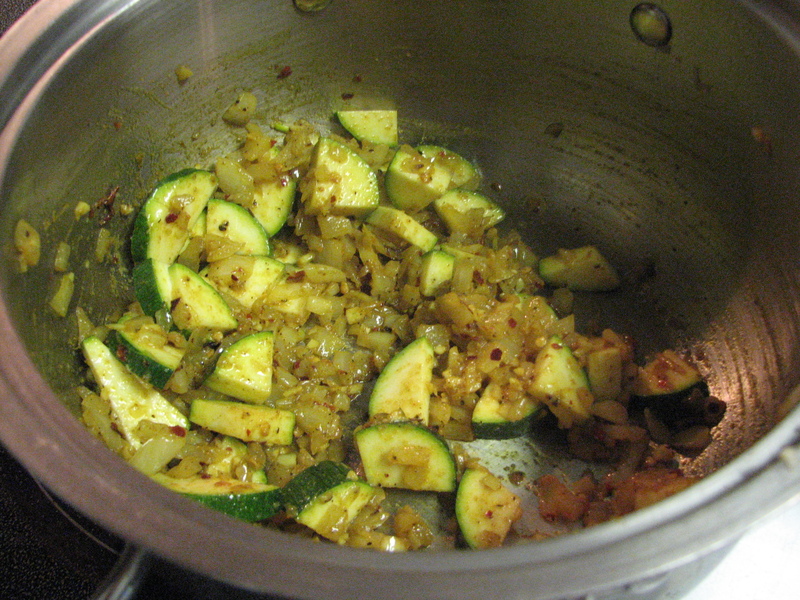 Add all seasonings and cook 1 minute more. 3. 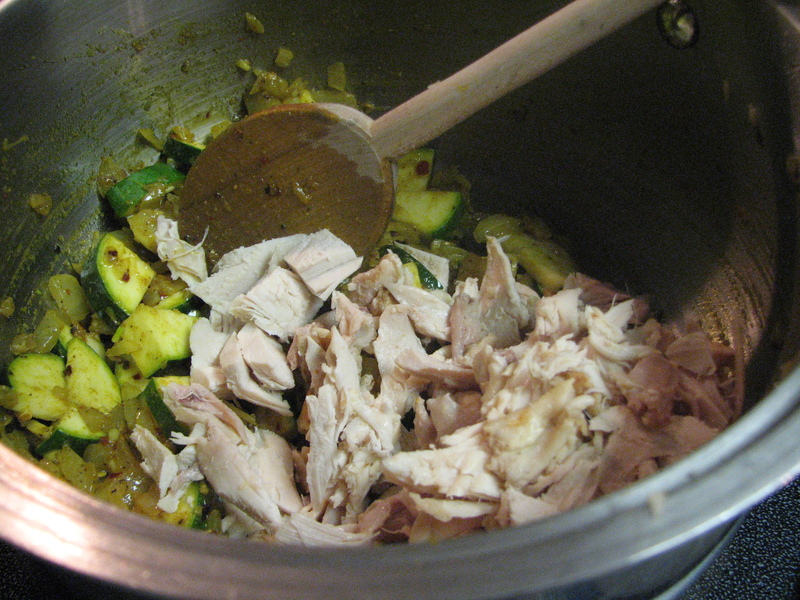 Add chicken, broth, tomato paste, stewed tomatoes and cashew butter. Stir until well combined. 4. Continue cooking until heated through. When I was flipping through the cookbook this was the first recipe that jumped out at me. I have no idea why because honestly the Cashew Butter would have deterred me. I don’t cook with peanut butter much (unless in baking). But this recipe spoke to me and I wanted to do it. I am so glad I did, too! It was probably one of the best things I’ve made in a long time. Michael wasn’t feeling well so he wasn’t going to eat any of the soup (which was a shame because it was amazing). He did try a spoonful to taste it and said it was fantastic. 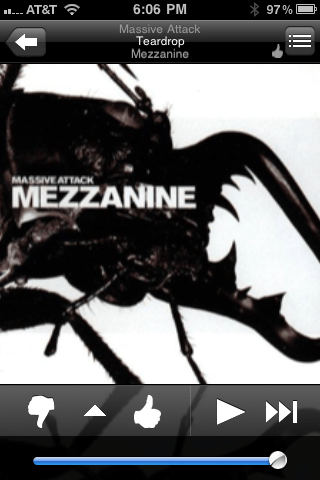 Anyway, back to the kitchen..I set up some mood music for my cooking adventure. 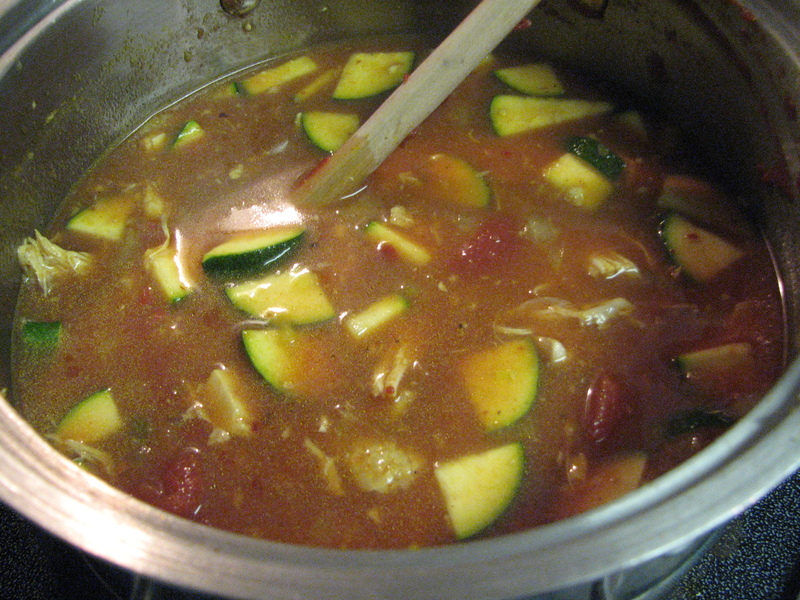 I got out all the ingredients and then realized I didn’t have stewed tomatoes–just diced. I wasn’t sure if that was considered the same, so back to the grocery store I went (for a 79 cent item). The sesame oil was surprisingly expensive, too, which I wasn’t expecting. I lucked out and found curry powder on sale (50% off) because that was also pricey. 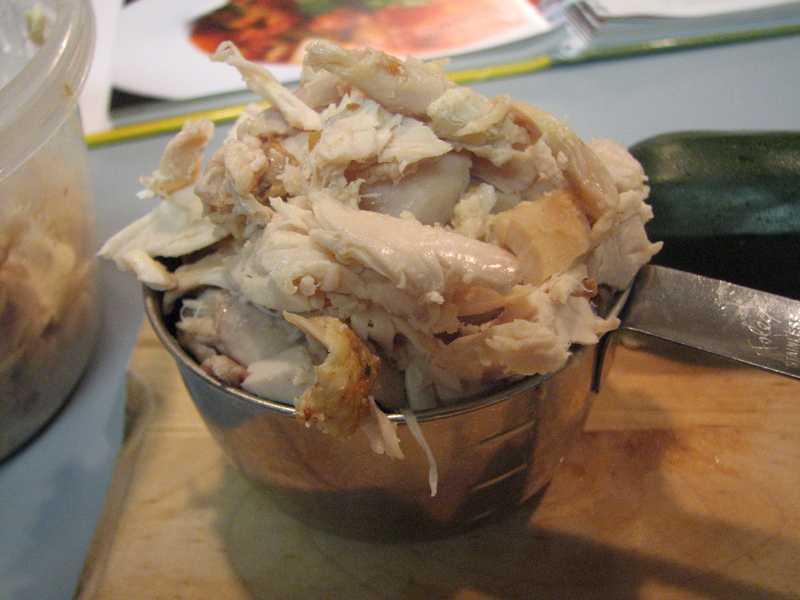 We had leftover rotisserie chicken from Friday night’s dinner so that’s what I used in the recipe instead of the plain chicken breast. The sesame oil smelled wonderful in the hot pot. It reminded me of Chinese food. 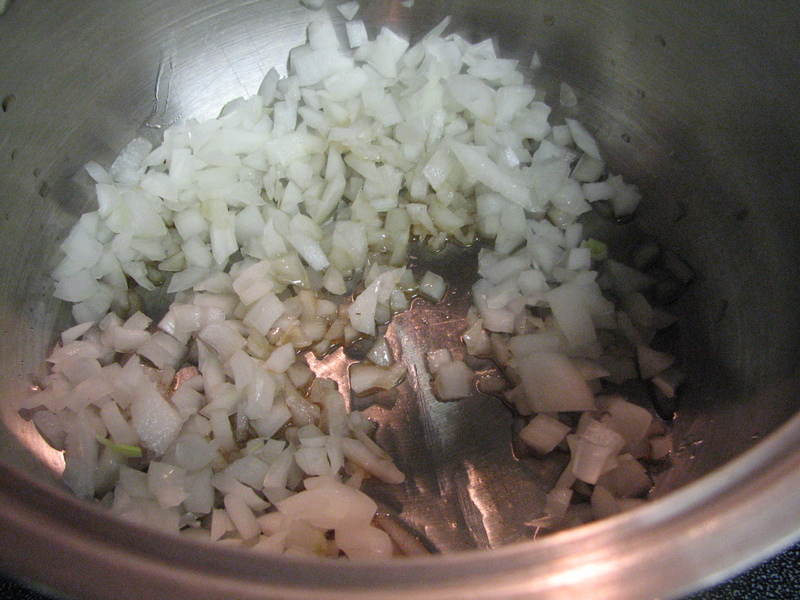 I added the diced onion to the pot. 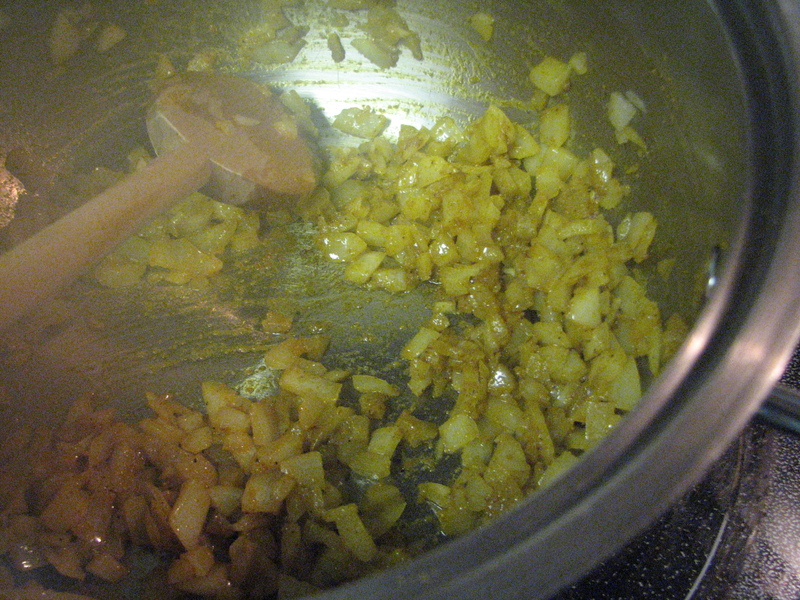 There is nothing better than the aroma of onion and spices sauteeing in a pan. 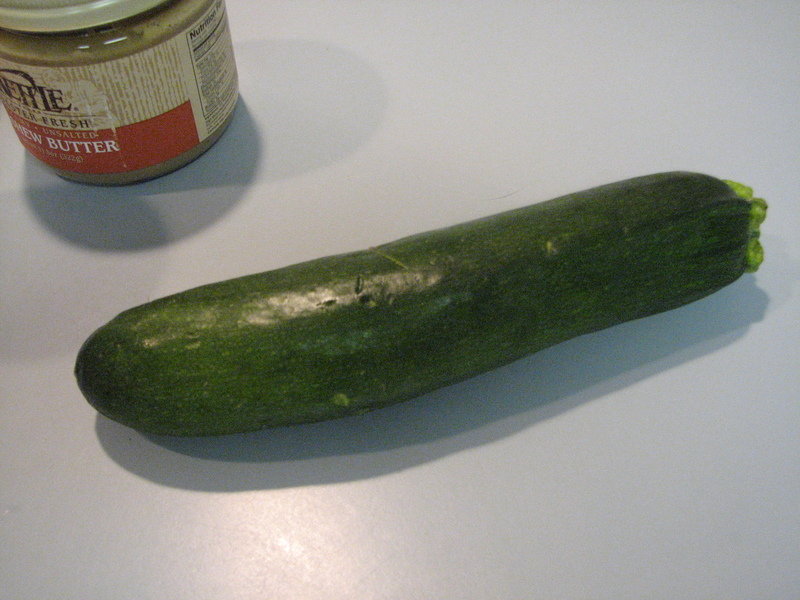 The recipe didn’t call for zucchini but I wanted to add a vegetable to the soup so I improvised. 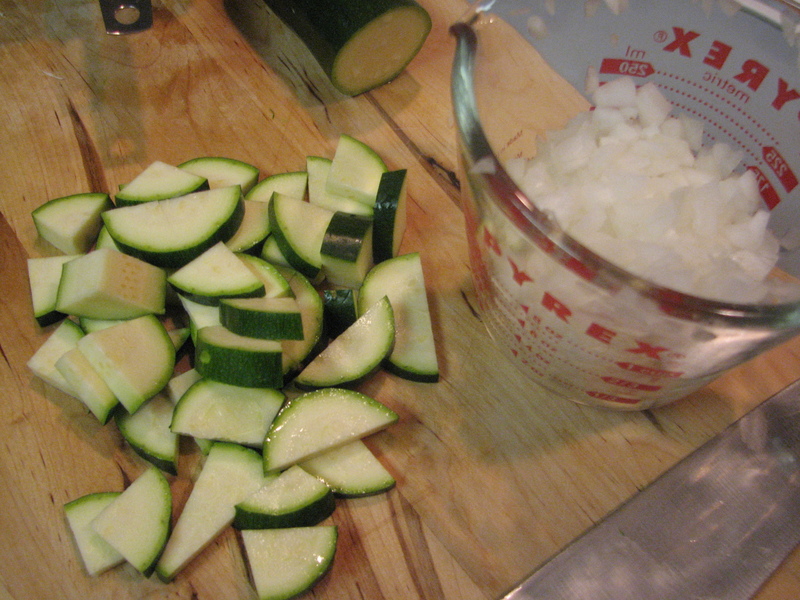 I also learned from past errors when cooking and made sure everything was chopped, minced, prepped, and measured out BEFORE I started cooking! Progress! The recipe could have used a little bit more chicken. 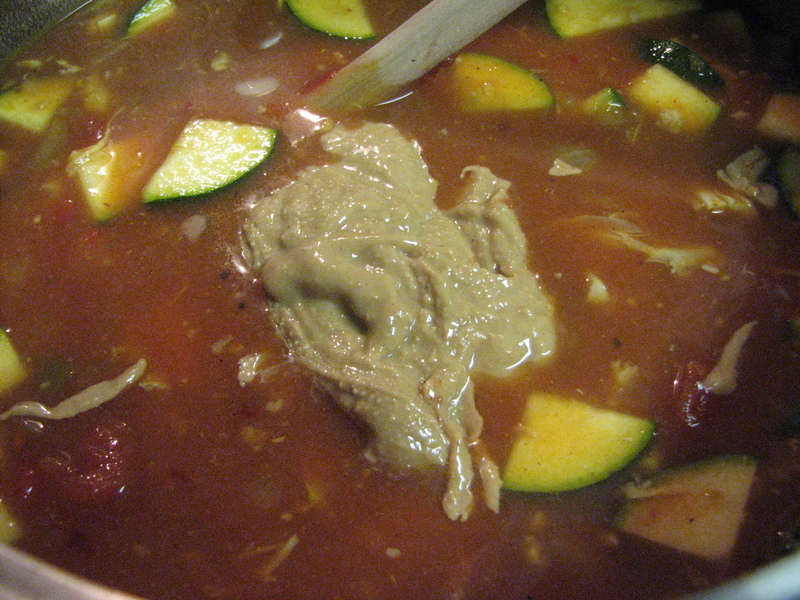 I added the chicken broth and tomato paste, plus the can of stewed tomatoes (don’t drain the liquid). 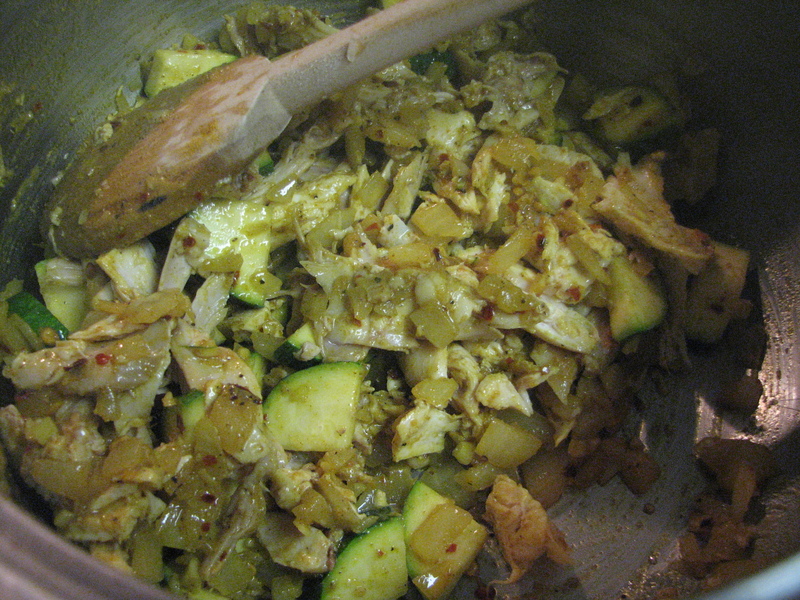 I was a bit worried at this point…the confidence I had for the recipe was faltering. It was too liquidy! I had hoped it would be a creamier soup. I decided to just let it be and not alter the recipe in any way. I added the cashew butter and mixed it all together. 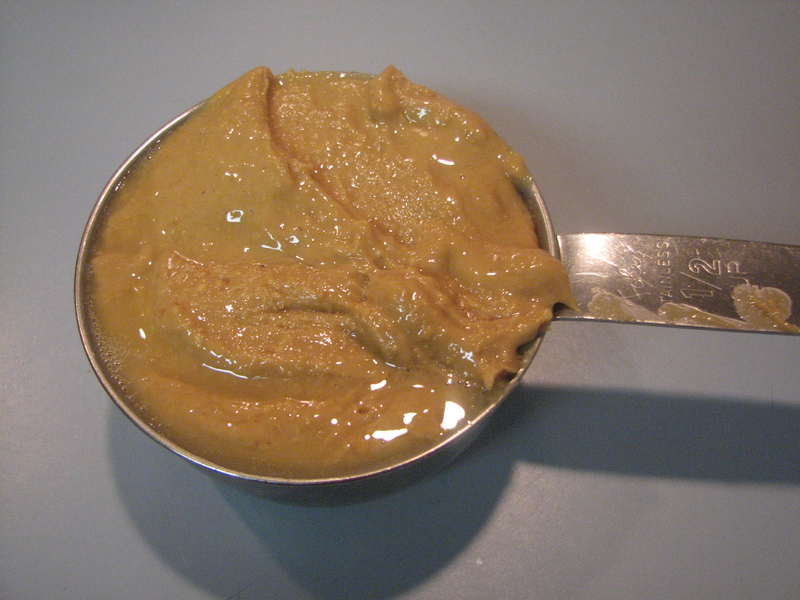 Once the cashew butter started to melt it thickened up the soup very nicely. I added a little more salt and pepper and a dash of more curry powder and continued to taste it to see if it needed anything more. 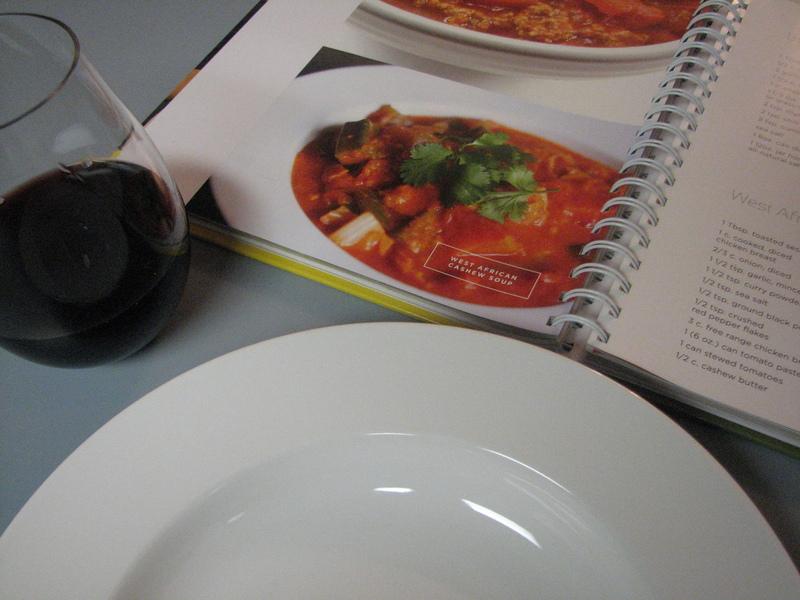 I poured myself a glass of red zinfandel wine while it cooked. I toasted a piece of Dave’s Killer bread to go with dinner. Finally the soup was ready. It’s probably the most delicious meal I’ve ever made. 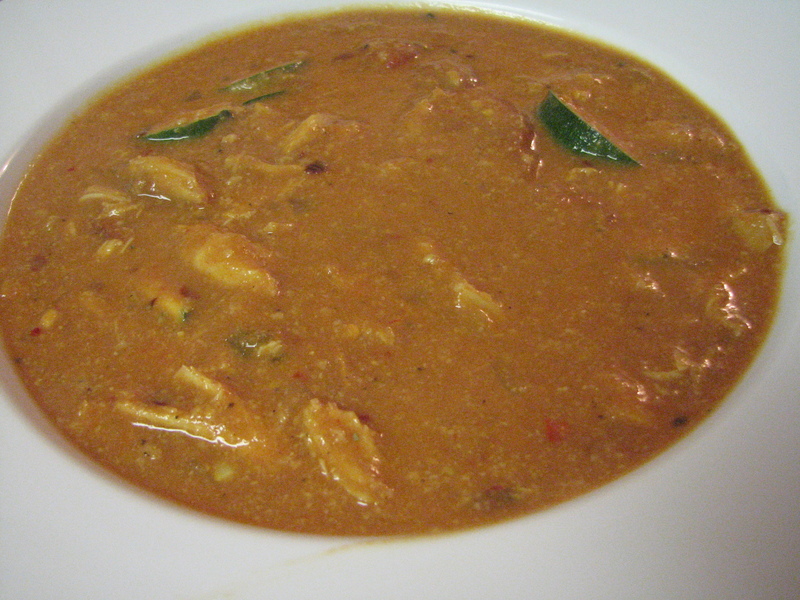 I can’t get over how tasty the soup is! 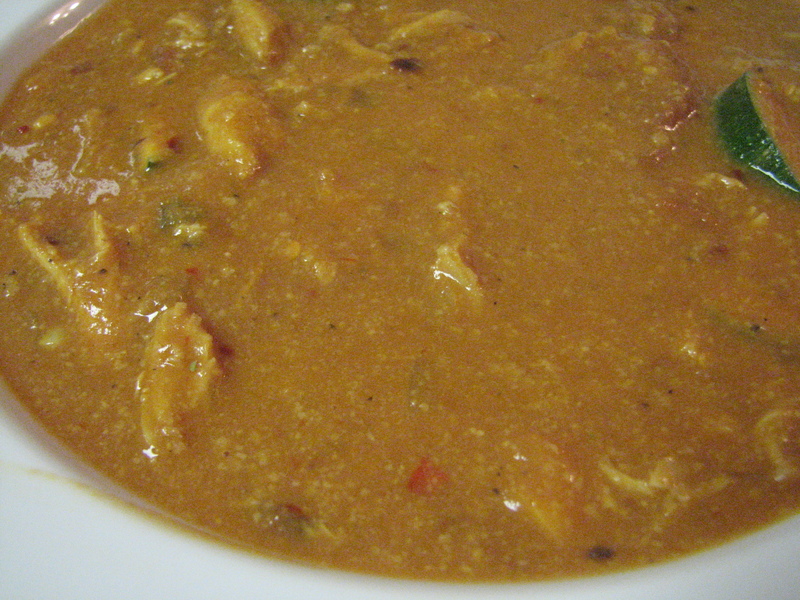 It’s creamy and spicy and the rotisserie chicken went really well as a substitute for the chicken breast. 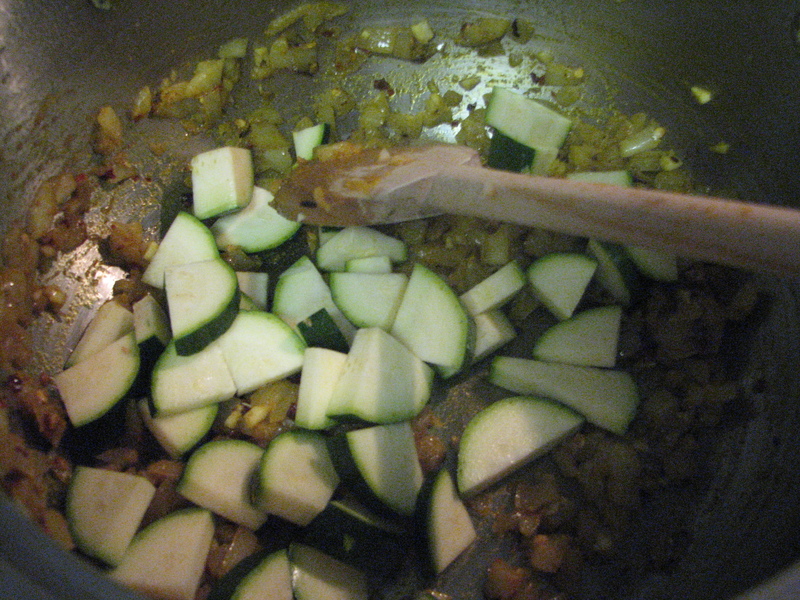 I’m also glad I added the zucchini. Having the vegetable in the soup made it heartier. 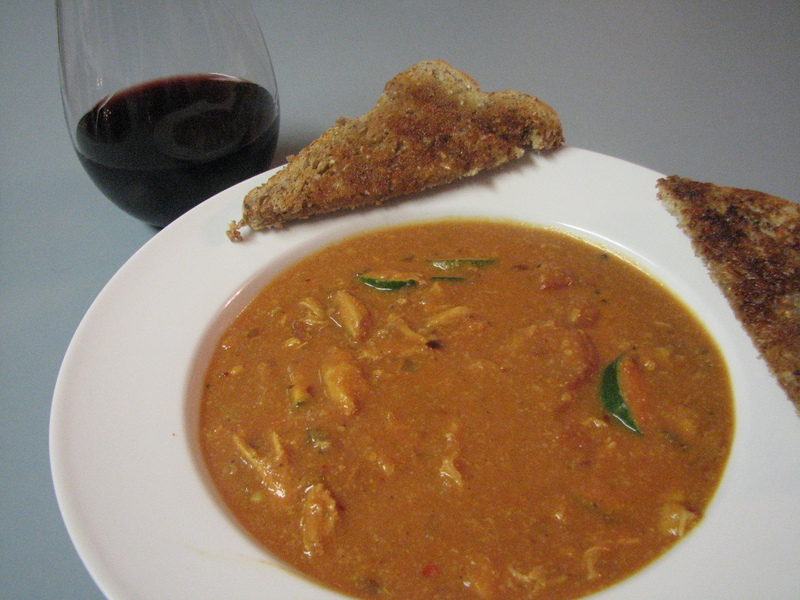 This is the first recipe I’ve tried from the cookbook. 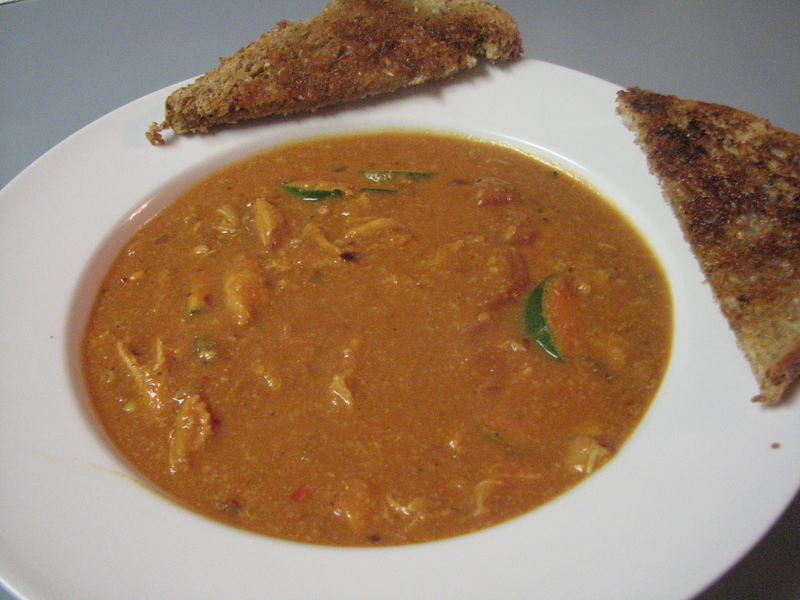 So far the cookbook is a success based on the West African Cashew Soup alone! None of the recipes have servings sizes…I had to guess about the soup…my guess is 8 servings?? I’m looking forward to trying the other recipes. I’ve already picked out 5 that I MUST try as soon as possible. Dinner was so amazing. I spent the rest of the evening feeling VERY proud of myself for making such a successful dish. I know it’s tecehnically just “following a recipe” and “anyone can do it” but I can’t tell you how many kitchen distasters I’ve experienced. “Just following a recipe” doesn’t mean it will be a success! This was a major success. I hope some of my readers try this recipe! QUESTION: Have you ever made anything similar to this? What else can I add to this soup? Dr. Josh is a CUTIE!…. and the food looks delicious! Hahahah. That sounds really soothing as the weather gets colder! 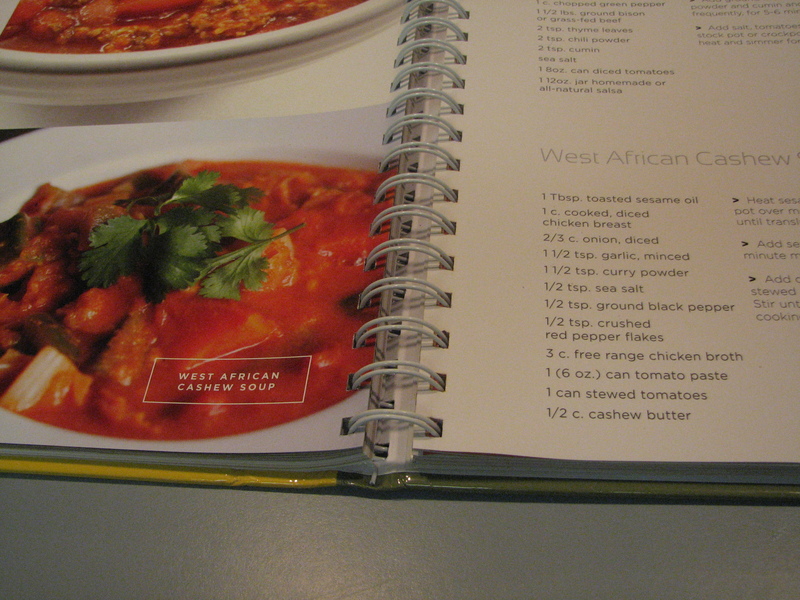 I love how West African dishes use alternatives to the classic oils and fats in cooking. My Dad spent his teens in Ghana and they used to spread avocado on bread instead of butter, because it kept better without needing refrigeration! That sounds and looks really good. Actually I don’t think everyone can just follow a recipe. I know a couple of people who just *can’t* follow a recipe no matter what. it’s like they have a short in their brain or something! Bookmarked! I LOVE cashew butter. It’s really good on oatmeal, or paired with “tropical” fruits. 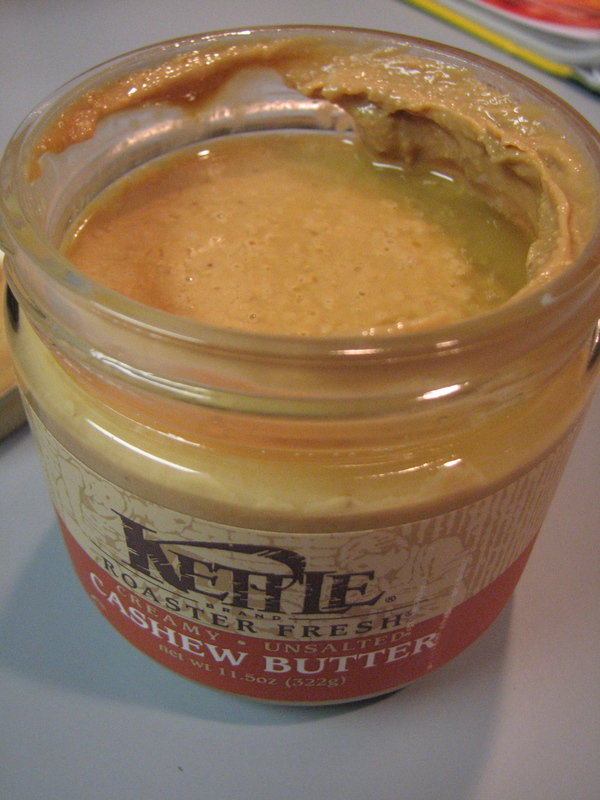 Although, I didn’t know Kettle made their own nut butters now! I almost always add frozen spinach to soups for extra greens. 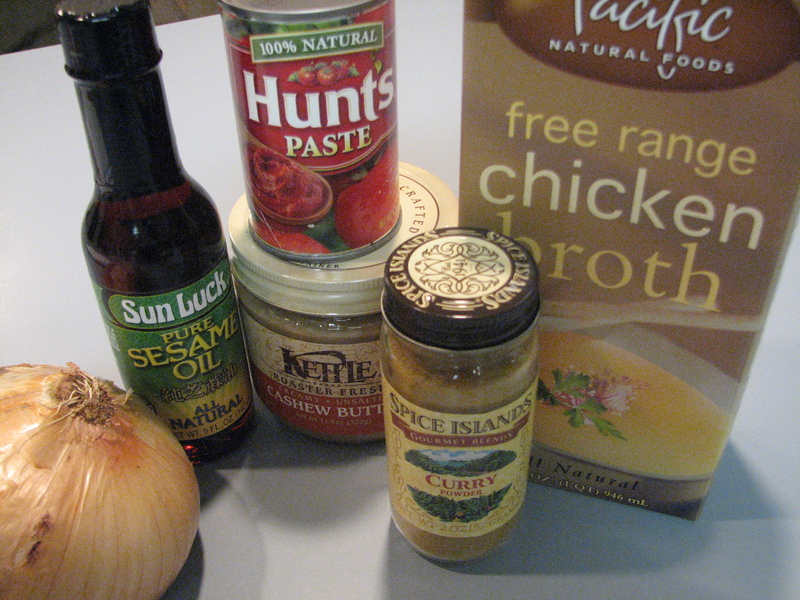 Or I bet you could leave out some of the chicken broth to make a thicker stew to eat on rice! You know I had the same thought that it would be great on rice! The soup sounds great! I’ve tried the protein pancakes from this book, they’re awesome! I have to say that I find it odd that calories and portion size aren’t included though. I like to know “about” how many calories, fat and protein I’m eating. I do too. And it’s weird the servings aren’t listed since it’s a “diet” cookbook! This soup sounds fantastic! I have a container of cashew butter sitting in my fridge right now, so I think I’ll make this today for lunch. I like the idea of having it with rice! Definitely give it a try. It’s super easy! True to my word, I made this for lunch, and I served it over quinoa. It was FANTASTIC! When I told my husband what it was, he made a face and said, “No thanks”. But then I insisted he try a bite, and he wanted his own bowl 🙂 I followed the recipe exactly as-is, and I don’t think I’d change anything. Thanks for posting! That’s so cool that you made it! And you know, I had the same reaction from people when I told them what it was but they all loved it when they tasted it. It SOUNDS weird but it’s GOOD!